23-Sep-2014 -- I have visited almost all of the confluence points in California, but it may be a while before I visit this one, as it lies in the middle of Mono Lake. The two previous visitors - both successful - used kayaks to reach the point. Perhaps someday I'll do the same, but on this trip, I was just driving through the area. Stopping at the Mono Lake Tufa State Reserve - at the southern edge of the lake - shortly before sunset, I found myself 4.15 miles (6.67 km) from the confluence point. 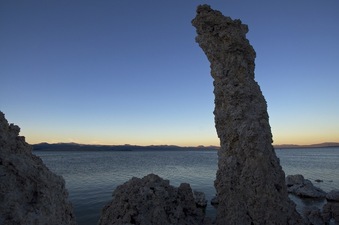 In the Mono Lake, a little more than a mile from the shore of Paoha Island.